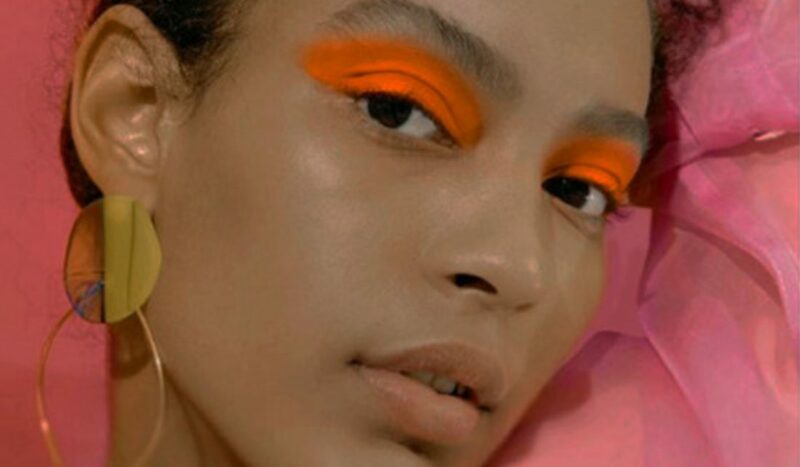 Beauty is an accessible pathway to the fashion world, regardless of the products used, more often than not one can recreate the season’s looks even when lacking the industry’s magical glam squads. 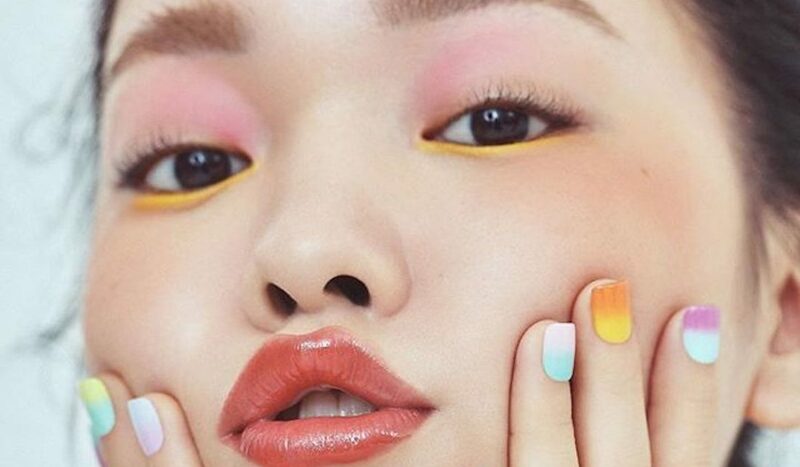 And thank the fashion gods for that, because February flashed before our eyes leaving a sparkly trail of makeup inspo behind. Fom bold lips to bare faces the fall intended looks are too tempting to pass up until September and I am ready to dive into the looks ASAP. 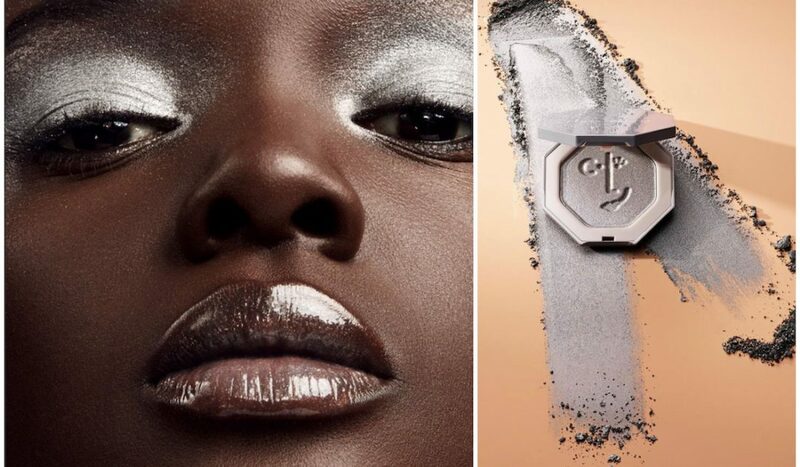 So prep the vanity because below are five looks to help channel the inner Pat McGrath in all of us! The runway was filled with its ‘pop’ moments as we got to see accent colors done right. There was everything from bright highlighter in the inner corner of the eyes at Fendi to bejeweled and green eyelids at the Prada show. 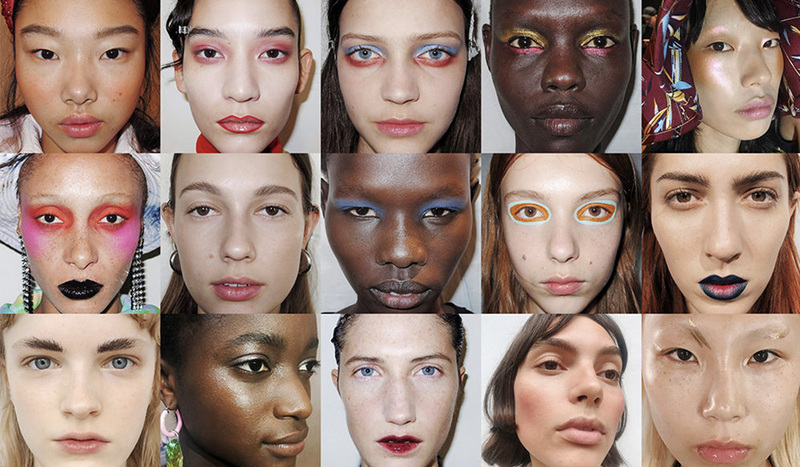 But a standout ‘pop’ moment was at Jeremy Scott’s show in New York, where beauty was led by makeup artist Kabuki. Together they presented neon wings, created with bright plastic, styled on the outer corner of the models’ eyes. The wings reached over the brows and up the temples making for some beautiful dimension in a rainbow of colors. If you want to try this look out, but plastic is a medium you have not yet conquered, there are still options to channeling the intensity of the Scott show. ColourPop’s Gel Liner in Teaspoon, an emerald green shade, for example is a perfect start. The liner is easy to work with and will have you delivering those galactic vibes in no time. And if you prefer liquid liner for your wings venture out with NYX’s Vivid Bright Liner collection. Available in 8 shades, you’ll have plenty to experiment with. Metallics and selective rhinestones are a happy medium between barely there shimmer and full on glitter-y disco ball. Which is why Jill Stuart’s FW ‘18 show alongside makeup artist Aaron de Mey made all of our aureate dreams come true. The models were armed with gilded lids to beautifully compliment their vino and olive hued ensembles. And umm…I am ready for my lids to glimmer as well. To recreate, dip into Anastasia Beverly Hills’ Single Shadow in Chiffon – a titanium antique gold, add a lil of M.A.C.’s Fix + to intensify the copper finish, and voilà – warrior eyes. If you want to dazzle a bit further go the Kate Spade route – where models were seen flaunting Swarovski crystals on a lightly did eye – and add a few jewels of your own. There is little room for error on both of these looks, but both have immense versatility so basically a win-win. Back to the basics. 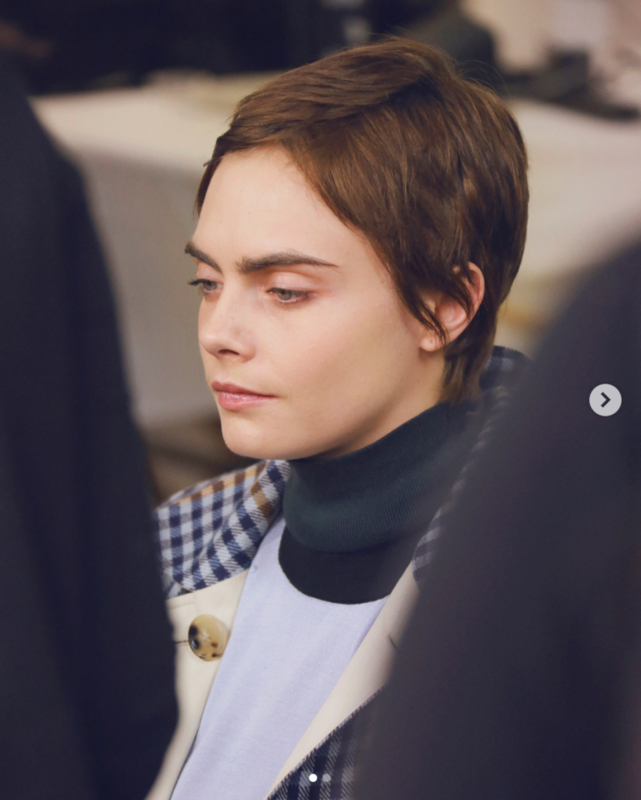 The bare faces of Burberry, created by makeup artist Wendy Rowe, had me reaching for all of my face masks in an attempt to achieve the same flawless canvas seen on the models. That look is reminiscent of that post-shower glow after doing a face mask and following up with your creamiest moisturizer. The goal here is to look perfectly hydrated without any excessive oils. A step in the right direction will be treating your skin to Farmacy’s Honey Hydrating Mask and following up with Bobbi Brown’s Vitamin Enriched Face Base. Creating the perfect foundation for your no-makeup-makeup look. 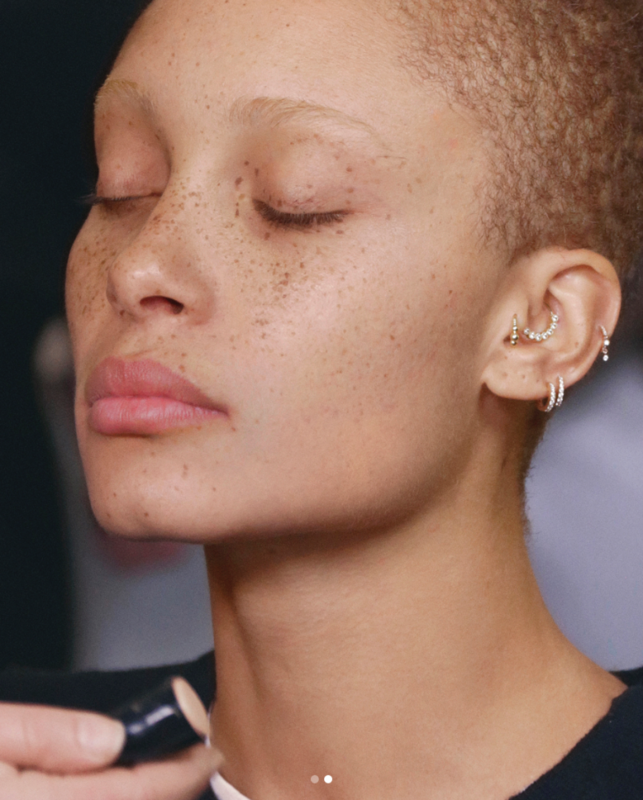 Beauty at Burberry did stray on the matte side, but if you’re looking to play it up a bit, add a touch of Girl Meets Pearl to the cheekbones, cupid’s bow and bridge of the nose for a natural-ish pizzazz. Top it off by lightly powdering away any shiny areas. Bold Lips. 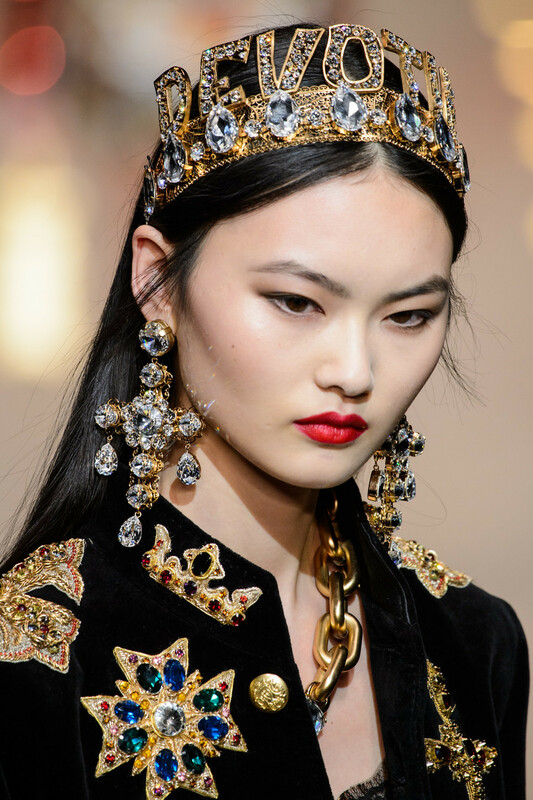 Pat McGrath lent her magic to Dolce & Gabbana in Milan, where she created the show’s striking pouts. But if you don’t have McGrath’s kit on hand, fret not, friend – the cherry red lips are still easily attainable. If you have not already tried the lipsticks by Bésame, a luxury vintage makeup brand, now is the time to do so. Their collection of crimson lipsticks are replicas of classic colors used in the 1920s, ‘30s, ‘40s and ‘50s by actresses in Hollywood during those respective eras. Apply 1946 – Red Velvet with Bésame’s signature lipstick brush for precision (and a little luxury), blot, and top with a final coat. Why go for statement piece jewelry when you can bring the ‘oomph’ to your lips?